World's Largest Selection of Wicks! For more information on Kosmos Lamps, click here. For tips on how to install Kosmos wicks and fit chimneys, click here. To have an idea of the ligne (''') of your lamp, click here. FEEDING A THICK WICK IN A KOSMOS BURNER, click here. TACKING THE TOP OF THE WICK IS SOMETIMES REQUIRED, click here. The prime period of Kosmos lamp lighting was the era prior to the wide-spread use of electricity. From 1875 until WW I, lamp manufacturers were in intense competition. There were few ''standard'' width wicks used as many manufacturers employed wicks of proprietary width and thickness as an advertising advantage for their lamps. I make customs wicks of the proper width and thickness for some of the more popular Kosmos, Matador and Agni lamps still encountered and in use today. Click here > for custom wicks. Kosmos 2 1/8" x 8" (54mm) 12 line ''' wick, pack of 3. 2 7/16'' x 24'' (62mm) thinner wick for some Kosmos lamps. 2 feet. 2 9/16" x 24" (66mm) thinner wick for 14''' & 15''' Kosmos lamps with smaller wick gap (Gaudard and Brokelmann, Jaeger & Busse 14'', which also requires a 12'' wick.) Per 2 feet uncut. 2 9/16" x 8" (66mm) KOSMOS #14 & #15 BURNERS - "14 line"' Thicker wick 0.110" - Special Purple Stripe. For Kosmos lamps with a larger wick gap. Per wick. 2 3/4" x 9" (2 13/16", 72mm) Kosmos wick. Some 14''' & 15''' Kosmos and P&A Harvard lamps - If your 2 9/16" wick has a gap at the top when installed, this is the wick to use. Medium thickness of 0.090". 3 5/8" x 8" (92mm), 30''' flat wick, thicker wick - 0.086" for Imperial Kosmos Vulcan burners; Brenner Ideal #20i Burner/ Trawler Lamp; German 20''' Baldur Brenner; 20''' Schwintzer & Gräff. (See photos of a large Kosmos-Brenner; photo 1, photo 2.) Perfect for sad iron heaters requiring 3 9/16 to 3 5/8" wide wicks. 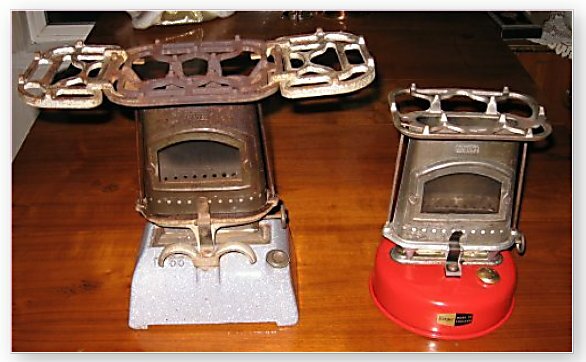 Installation instructions > click here SAD IRON STOVE WICKS Per wick. 3 5/8'' x 8" (92mm) wide, 0.108" thick for 20''' DHR & L&B Matador lamps and many other 20''' Matador lamps using my new neoVulcan chimney. Custom wick. 3 5/8'' x 8" (94mm) wide, 0.108" thick for W&W 20''' Agni lamp using my new neoVulcan chimney. Custom wick. 4" x 8" (101.6mm), 40''' flat wick for some Kosmos-Brenner burners. Ideal for sad irons requiring 4" wicks and European stoves like the Beatrice Boiling Stove & Canadian SMP or GSW "Hot Blast" heater. Thicker 0.092" thickness. Thinner wick for narrow wick gaps is below. 14''' Sans Rival borosilicate chimney (for more information, click here) Out of stock AGAIN. Handy short chimney for finger or carrying lamps such as the Kosmos Concierge. #15 line Kosmos lamps with flame spreaders. 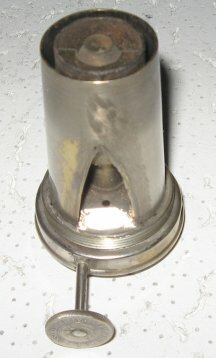 Short chimney for use in hanging and bracket lamps. 20''` neoVulcan Matador & 20''' W&W Agni, Borosilicate glass. 2.465" slip, 12" tall. Turns a common 20''' Matador lamp into a brilliant ''white light'' lamp by controlling the shape of the flame and the draft around the wick. 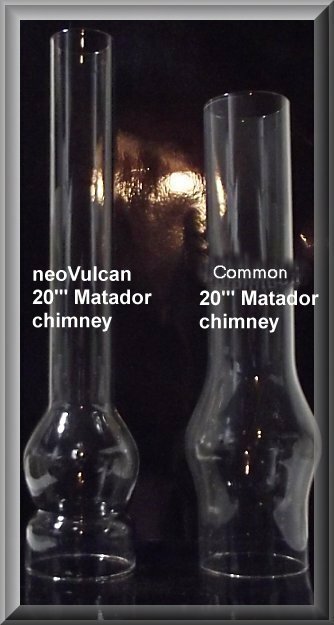 I designed this chimney using the Vulcan principle patented by Emil Wild on August 19, 1884. The flame is absolutely stable even at a full curl. These chimneys require the use of a proper, thick wick as originally designed. (See above). Kosmos lamps have been made by literally hundreds of different manufacturers in the past 150 years. Any ''standards'' are hypothetical. 8''' Kosmos chimneys are a nominal 1.50'' OD slip-fit. The largest base diameter 10''' Kosmos chimney I have is an original signed W&W that measures 1.57'' base diameter. 7/100th is extremely close for a minimum/maximum spread. Quite common prior to WW II was a Kosmos chimney with 1.53'' base diameter designed to fit either 8''' or 10''' Kosmos lamps. Virtually any Kosmos chimney from 1.500'' to 1.57'' base diameter will fit over the burner cone and within the base of the chimney fingers. 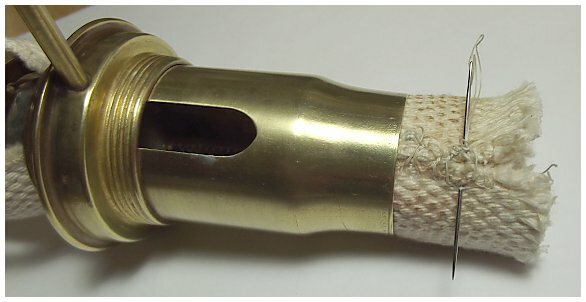 The brass chimney fingers can then be adjusted to fit the chimney. 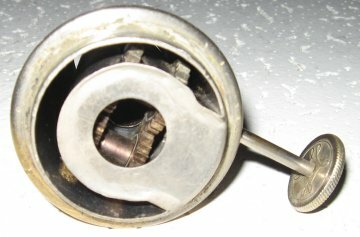 The wick in Kosmos lamps is flat and curled round by the gearing (shown above). The wick must fit inside the circumference of the outer wick tube. Kosmos wicks are sold by their width, but determining that width when there is no fragment of a wick left to measure can be challenging. Measuring the diameter and referring to the chart below is one relatively easy way to select the proper fitting wick. 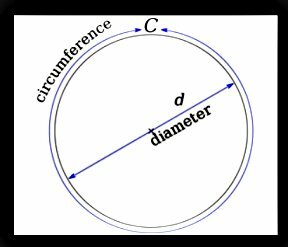 I have listed below the inside diameter of the top of the outside wick tube for various Kosmos lamps I own, shown below the line number and width in inches. Please note there were hundreds of manufacturers, so dimensions may well vary, in some cases vary considerably. 6'' 0.575" 1 3/8" 1 5/16"
8''' 0.620'' 1 5/8" 1 7/16"
10''' 0.668" 1 7/8" 1 1/2"
12''' 0.724" 2 1/8" 1 7/8"
14''' 0.900" 2 9/16" 2.0" to 2 1/16"
16''' 0.916" 2 3/4" some 2.0" to 2 1/4"
18''' 1.226" 2 3/4" some 2 7/16"
20''' 1.387'' 3 5/8" 2 7/16"
Feeding a thick wick from the bottom of a 20''' Matador burner can be a challenge. 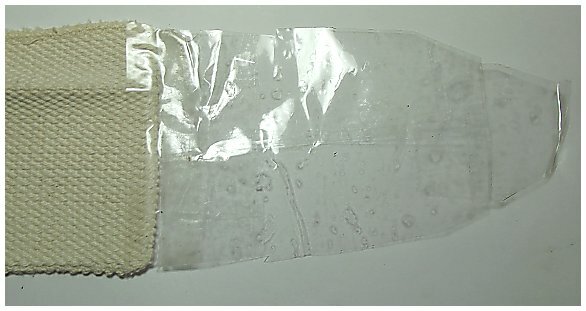 Making a tape extension as shown at right makes the process much easier. The tape is pushed up through the wick gap, then the wick gently pulled up through the gearing. Many Kosmos lamps are well over a century old and the gearing mechanism can be worn, resulting in the wick rising unevenly. To correct that the top 1/2'' of the wick can be sewn together as shown below. 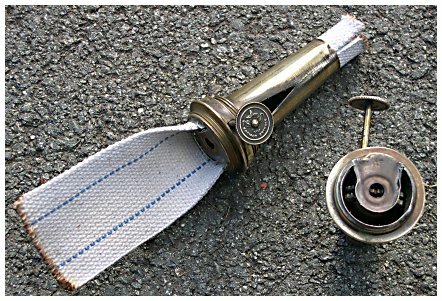 The photo at left shows the well-worn Gladiator burner could not raise the wick uniformly. The top 1/2'' was sewn as shown, then the wick was trimmed and burned level to achieve a smooth, even top surface. Because the inner draft tube is tapered, the wick can be sewn together no lower than 1/2'' from the top of the wick. #1B, #1M, #1R, #2M, #2L, #2R, #2 P&A, #2B, #3L. Lamp wick by the roll. Center Draft Lamp chimneys in borosilicate glass from Junior "Tiny" to Mammoth lamps. #0M, Rayo Jr., 2 1/2", 2 5/8", 2 15/16", 3 1/8", 4", 4 1/2"
20''` neoVulcan Matador - New! Student Lamp Sans Rival Chimney with 1 7/8" fitter!!! Lamp Chimneys - Dimension of nominal base diameter by make, model and "line". Flame Spreaders and "Smoke Consumers"
Vulcan, Imperial, Veritas, Belgian, Hinks, Messenger's, Young's Court, etc. Links to web sites for parts, information and restoration.